Graduates may set to work as advisors, designers or project leaders and take up careers with consultancies, contractors, water utilities, water boards or regulatory bodies, relief agencies and international organisations. The Master’s gives access to third cycle studies (PhD/Specialisation schools) and to professional programmes. Hydraulics and hydraulic works; Land survey; Transportation and Road Engineering; Geotechnical Engineering; Structural Engineering. For Non-EU citizens, an annual quota of places is set each year by the University of Bologna. 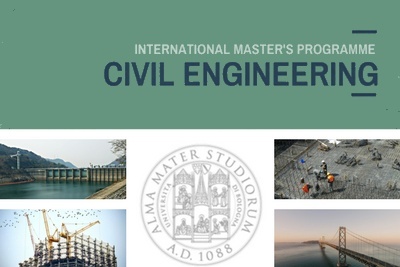 For the Master’s in Civil Engineering, in the academic year 2018/2019, a maximum of 60 Non-EU students will be accepted. Please note: no entrance exam nor Italian proficiency test are required for the Master’s Degree Programme in Civil Engineering. The programme is intended to provide students with firm technical bases while nurturing decision-making and leadership potential. It prepares graduates to practice their profession at an advanced level and with a unique exposure to an international environment to better understand global issues of civil engineering. The core modules, common for all students (1st year), aim at consolidating fundamentals and improving modelling capabilities in the classical areas of Civil Engineering such as structural mechanics and engineering, hydraulics and hydrology, soil mechanics, road design and transportation. Students then choose to specialise either in Infrastructure design in river basins or in Structural engineering. Students to become skilled in civil-engineering project-management, in design and analysis of civil-engineering structures and infrastructures, providing a comprehensive know how on civil engineering materials, technologies and processes. In order to obtain the Master Degree (Laurea Magistrale), students must successfully complete all the courses and discuss a final dissertation, for a minimum of 120 Credits (ECTS). The courses will be organized with in-class teaching activities, practice, design and laboratory activities. The final exam consists in the public discussion of a dissertation (the master thesis). Thanks to Dual Degree agreements, students can obtain two qualifications in two years. The partners are Columbia University (New York, USA); University of Miami (Florida, USA); Université de Liège (Belgium). Furthermore, international agreements allow students to spend part of their studies abroad (for exams, research, or internships).